(R to L) Senator Shannon Jones stands with Jennifer Cunningham (Worthington) and Senator John Eklund to announce legislation to lift the financial strains on Ohioans with disabilities and their families. 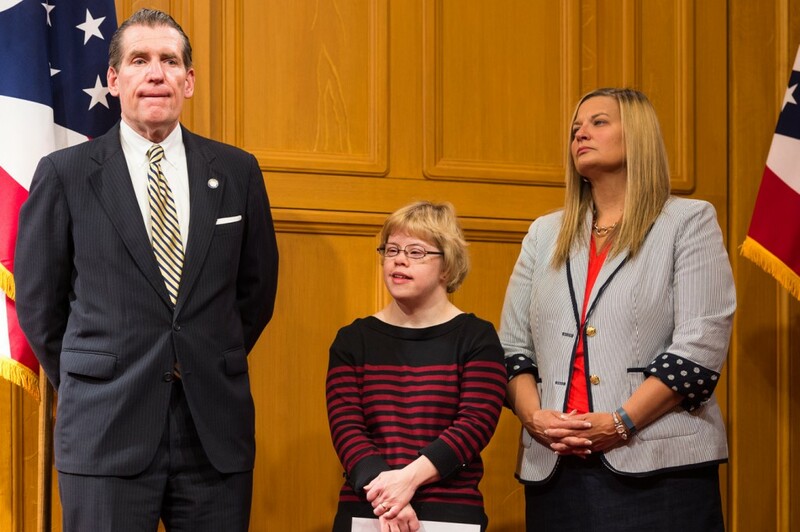 Columbus, OH – April 16, 2015 – (RealEstateRama) — State Senator Shannon Jones (R-Springboro) today introduced legislation aimed at lifting some of the financial burden carried by Ohioans living with disabilities. Jointly sponsored by State Senator John Eklund (R-Munson Township), the bill would allow eligible disabled individuals and their families to establish ABLE (Achieving a Better Life Experience) savings accounts. Similar to 529 education savings plans, these tax-advantaged accounts would provide the opportunity to save for disability-related expenses without losing eligibility for public benefits. Currently, disabled individuals are unable to report more than $2,000 in cash savings, retirement funds and other assets if they are to remain eligible for a wide range of public benefits, including Medicaid and Supplemental Security Income (SSI). This monetary cap limits the ability of many individuals to pay for disability-related expenses such as transportation, employment training, legal fees, education and assistive technology. The bill will harmonize Ohio law with federal legislation that was signed last December. Seven states have already enacted similar legislation, and ABLE is awaiting passage or signature in twenty-eight additional states. The bill will now go to a Senate committee for further consideration.